Me: Is Kale supposed to burn your eyes when you Juice it? Me: Is it supposed to burn and make your eyes sensitive to light? Kyle: Maybe you’re doing it wrong?!? Me: hmmm? I wonder if I’m allergic? My in laws are not only some of the most fashionable people I know, but also some of the most fit. I would love to say that they eat cheeseburgers and smoke cigarette’s all day to maintain there amazing physique, but this couldn’t be further from the truth. Kyle was taught that food is fuel; I was taught Mangi! Mangi! It must be all the Juicing! They proceeded to explain that they had been eating Raw and using a Jack La Lanne Juicer. You can eat all day ,lose weight, and your skin looks amazing. Count me in. To Barnes and Nobel I went with two key words, Raw and Juicing. I was on fast track to becoming a raw foodiest! Morning one of my Juice Cleanse. The juicer was amazing and powerful. Every vegetable I pulverized made me feel healthier and stronger; but what happened when I started juicing the Kale would change my life forever. I made my first juice: Green Lemonade and was supposed to consume a mason jar full of this juice three times a day. Once I had juiced most of the produce I only had the kale left , as I pushed the kale through the juicer it released a pungent odor and fumes that made me hide my head. Surely this detox is working, but sensitivity to light? On the fifth Day I decide to get my produce at The Fresh Market instead of the Harris Teeter. I Couldn’t seem to find the Kale, so I asked. Me: Excuse me Sir, I cant seem to find the Kale? TFM Employee: Oh, That’s because we haven’t put out yet. Let me get it from the back. The man returns with a box, and pulls out this beautiful over sized green leaf. ME: Sir, are their different types of Kale? So once I had real Kale not only in my Juice, but Raw there was no eye stinging or green oozey drinks, and green lemonade became one of my favorite juices’. So what’s Kale got to do with it? 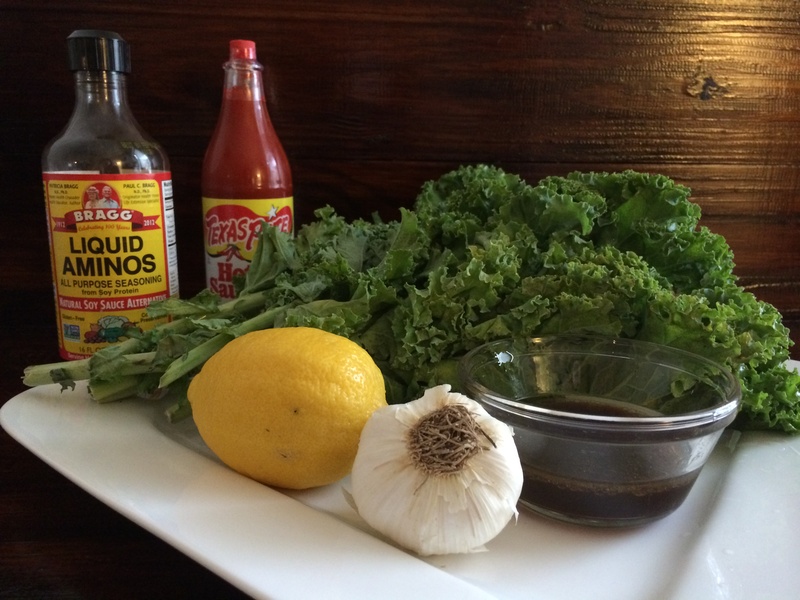 I just wanted to Share my favorite Kale Salad recipe with you: that is all. Cover Washed and Cut Kale in Dressing until Kale is saturated. I’ve Found the best way to do this is by shaking vigorously in a sealed plastic container or bag. Warning it is Spicy, but after all What’s Kale got to do with that anyway!